Lawyers for Lawyers is an independent civil society organization which seeks to promote and protect the independence of the legal profession through the support of lawyers around the world, who face reprisals, improper interferences or restrictions in carrying out their professional functions. Lawyers for Lawyers has Special Consultative status with the UN Economic and Social Council since 2013. The Law Society of England and Wales is a professional body representing more than 180,000 lawyers in England and Wales. Its aims include upholding the independence of the legal profession, the rule of law, and human rights around the world. The Law Society has special consultative status with the UN Economic and Social Council since 2014. Lawyers’ Rights Watch Canada (LRWC) is a committee of lawyers and other human rights defenders who promote international human rights and the rule of law through advocacy, education and legal research. LRWC is a volunteer-run NGO with Special Consultative status with the UN Economic and Social Council since 2005. The Bar Council of England and Wales represents over 16,000 barristers in England and Wales. It promotes fair access to justice for all, as well as the Bar’s specialist advocacy and advisory services and the highest standards of ethics, equality and diversity across the profession. The Bar Council is committed to upholding the rule of law both domestically and internationally and speaks out whenever and wherever rule of law crises occur. Many of its members are advocates in human rights and constitutional cases in the UK and around the world. The Bar Human Rights Committee of England and Wales (BHRC) is the international human rights arm of the Bar of England and Wales. It is concerned with defending the rule of law and internationally recognised legal standards relating to human rights and the right to a fair trial. Lawyers for Lawyers, the Law Society of England and Wales, LRWC, the Bar Council of England and Wales and BHRC are concerned about the arrest and detention of lawyer Ms. Nasrin Sotoudeh in Iran. It is apparent that Ms. Sotoudeh’s arrest is solely connected to her legitimate activities as an attorney. According to our information, Ms. Sotoudeh was arrested on 13 June 2018 at her home in Tehran and was taken to Evin prison. At the time of her arrest, she was told that she was being detained to serve a five-year prison sentence on charges for which she has never been notified, tried, or convicted of. Since then, she was informed that she is facing new charges of “spreading propaganda against the system” and “gathering and colluding to commit crimes against national security”. Ms Sotoudeh allegedly refused to pay the bail set for her release, because it was a disproportionately high amount. She also expressed concerns about the lack of due process and objected to the requirement to select her defence lawyer from a limited State approved list. Prior to her arrest, Ms. Sotoudeh was representing women’s rights activists, who peacefully protested against the compulsory veiling in Iran, and were subsequently prosecuted. It is reported that, during a visit to Evin prison on 17 June 2018, Ms. Sotoudeh informed her husband that her charges seem to relate to “colluding” with Shaparak Shajarizadeh. Ms. Shajarizadeh is one of the women Ms. Sotoudeh was representing in a case brought against a number of individuals who had protested against compulsory veiling, while they were in the prosecutor’s office in Kashan, Isfahan province. Ms. Sotoudeh has also publicly criticised the recent implementation of the Note to Article 48 of Iran’s 2015 Code of Criminal Procedure, which denies individuals accused of certain offences, including those related to national security, the right to access a lawyer of their own choosing during the investigation of the charges against them. Instead, individuals have to choose their lawyer from a list approved by the Head of the Judiciary. On 4 June 2018, the Judiciary issued a list with only 20 state-approved lawyers for Tehran province from which individuals can select lawyers to represent them, to be followed with lists for other provinces. Lawyers for Lawyers, the Law Society of England and Wales, LRWC, the Bar Council of England and Wales and BHRC consider that the arrest of Nasrin Sotoudeh is aribrary and extra-judicial, intended to punish and prevent her legitimate activities as a responsible and widely respected lawyer. 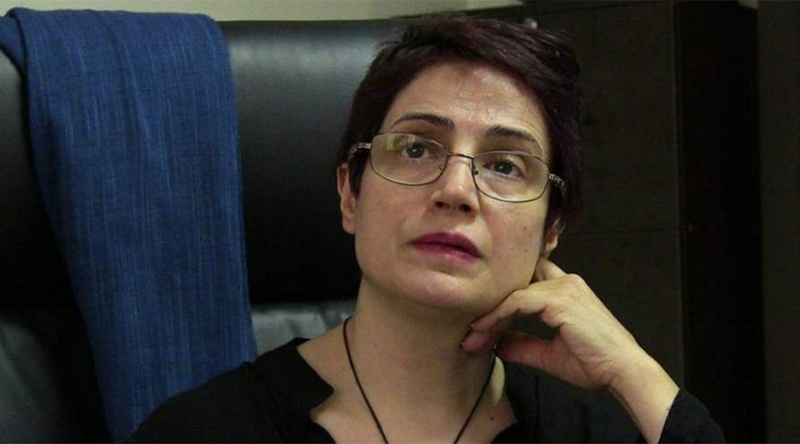 Nasrin Sotoudeh has been previously arrested in connection with her work as a lawyer. In January 2011, Ms. Sotoudeh was sentenced to 11 years imprisonment on charges that included “spreading propaganda against the system” and “gathering and colluding to commit crimes against national security” . Her sentence was reduced to six years on appeal and she was released early in September 2013 after receiving a pardon. After her release, Ms. Sotoudeh was subjected to a ban on practising law. In 2014, after she undertook sustained daily protests outside Iran’s Bar Association, the disbarment decision was overturned. Since then, Ms Sotoudeh has continued to provide legal representation and a voice for clients and causes unpopular with the Government of Iran. In reprisal, we understand that she has faced years of harassment and intimidation. 16. Governments shall ensure that lawyers (a) are able to perform all of their professional functions without intimidation, hindrance, harassment or improper interference (…) and (c) shall not suffer, or be threatened with, prosecution or administrative, economic or other sanctions for any action taken in accordance with recognized professional duties, standards and ethics. As a member of the United Nations (UN) and a State Party to the UN International Covenant on Civil and Political Rights (ratified on 24 June 1975), Iran is obliged to guarantee for all persons within its territory rights to, inter alia, liberty and freedom from arbitrary detention (Article 9); the presumption of innocence (Article 14.2); to pre-trial release (Article 9.1); representation by a lawyer of choice (Article 14.3 (d)); notice of charges and time to prepare a defence (Article 14.3 (a)); and to the determination of charges and rights by an independent, impartial and competent court (Article 14). Guarantee in all circumstances that all lawyers in Iran enjoy and carry out their legitimate professional rights and duties without fear of reprisals and free of all restrictions, including judicial harassment. We look forward to a detailed response to our concerns as set out above and we will continue to monitor this case closely. Prior to her conviction in 2011, Ms. Sotoudeh represented many of the human rights activists who were arrested after the presidential elections in June 2009. She also defended Shirin Ebadi, the human rights lawyer and Nobel laureate who co-founded the Defenders for Human Rights Center. She also acted as lawyer of the Iranian-Dutch Zahra Bahrami, who was executed in Iran on 29 January 2011. The UN Basic Principles on the Role of Lawyers provide a concise description of international norms relating to the key aspects of the right to independent counsel. The Basic Principles were unanimously adopted by the Eighth United Nations Congress on the Prevention of Crime and the Treatment of Offenders in Havana, Cuba on 7 September 1990. Subsequently, the UN General Assembly “welcomed” the Basic Principles in their ‘Human rights in the administration of justice’ resolution, which was adopted without a vote on 18 December 1990 in both the session of the Third Committee and the plenary session of the General Assembly.